It may not come to a surprise to many that I really enjoy the XR, but I've been looking at new bikes for the past few months. I decided I would sell the supermoto and get something light for the mountains/track, something along the lines of a Street Triple or Duke 790. I didn't really have plans to trade my BMW, but the more I looked around the more it made sense considering the deals I saw. - Triumph Tiger 1200 XCa, phenomenal bike, super comfortable and the Mrs. loved the heated seats. I really enjoyed the noise that the triple engine makes and that it comes fully equipped with crash bars, additional LED lights, etc. In my eyes it looks good too. Saw a new one on sale for $16k (USD). 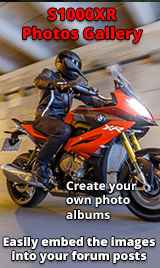 - BMW R1250GS - the GS is just amazing and it already received the updates that we're waiting for the XR. Since I would have a bike to rip around the mountains, this would make sense as a second bike for two-up riding, longer trips and even doing a bit of offroading which I'd like to do in the future. The problem is that you won't find any deals on it since it's so new. Then I visited El Paso, Texas and noticed they still have two S1000XRs from 2016. These bikes never sold, they had been sitting on that dealership floor for the past three years along with two '16 Pikes Peak edition Multistradas (MSRP $22K, on sale for $15.5). So I asked how much I could get for my 33k miles XR, and they told me $8500. Considering my bike was going to need some maintenance soon (valve adjustment check, fork service, chain & sprockets), I ended up trading it for one of the "new" 2016 XRs which came out to $14k out the door. Time to do it all over again. Already have headers, tuner, crash bars, screen, tank bag, GS-911, basically all the mods swapped straight over. Now that the XR has been around for a while, there are some amazing deals to be found. Even almost 4 years later, the bike still holds its own against the competition with its excellent electronics package and features. Great videos by the way, really enjoy them. And because of you (thats my excuse to the Mrs) I too have recently rejoined the XR riders and will be picking up the HP Motorsport one on Saturday. Akra headers already sat here next to me, Sc project on order and now eyeing up new rubber to replace the stockers. I see Dunlop have just launched the new Sportsmart 3, just waiting for a feedback review on those and i might give them a whirl, either that or i'll probably go M7rr as I've always enjoyed them at pace on the road or track. I’m certainly not prepared to part with my X/R so recently purchased a KTM GT sure enough came with Angels the 4th set i’ve encountered with the same god awful feeling,I’m a great fan of Dunlop’s both Sport and Road but when asking my supplier SportSmarts or RS’s for the GT not even the slightest hesitation RS’s and as we are good friends I was happy to believe him/them. Must be popular currently difficult to get hold of(fronts)because of demand normally run a sport tyre on the front and Sport Touring on the rear but after 3000 miles the rears loose their shape and I take them off and thought sod it may as well run a sport pair instead. Let us know when you have fitted them we should have a section on here for the ‘I’ve fitted aftermarket headers’ what a bloody job that is most of which hinges on the inner flange nuts on the originals!!!! Go to the Akrapovic website there are some fitting instructions which are really good,the only thing they do not cover is sealing the hole up on the box that house’s the exhaust flap motor. And yea getting your mate to do it is cheating but sensible the good news fitting the new headers is a doddle. My mate will be fitting these headers within the next couple of weeks and i just wondered whether this part needed any inside info to help him out or is it quite obvious? The Akra instructions are pretty good but what you will need is a 10mm 12 sided socket for the header nuts with a knuckle and a decent extension bar the ball ache are the two inner pipe nuts. As per the instructions the rad and the oil cooler need moving(not a lot) cover them with card board to stop any damage to the fins,when you come to refit them make sure you fit the stabilising bracket first cuz it’s a real MF to fit when the rad and oil cooler are back in situ. When you get the stock headers off it’s only then you realise what a piece of massed produced sh#t it really is.